SharePoint quota templates enables us to keep the site collections growth in control. It defines the maximum amount of data stored in a site collection and prevent from disk fillings! Quota template makes it easier to govern site collections growth by assigning a pre-defined sizing template to them, rather assigning individual quotas to each site collections in the farm. Quota templates set how much storage space a site collection can occupy. Quota templates offer two levels: Warning Level and Maximum Storage Level.Once the site collection reaches warning level, SharePoint triggers an Email to site collection administrators and further addition to site is possible until it reaches to Maximum storage level. How to Create a New Quota Template in SharePoint 2010? 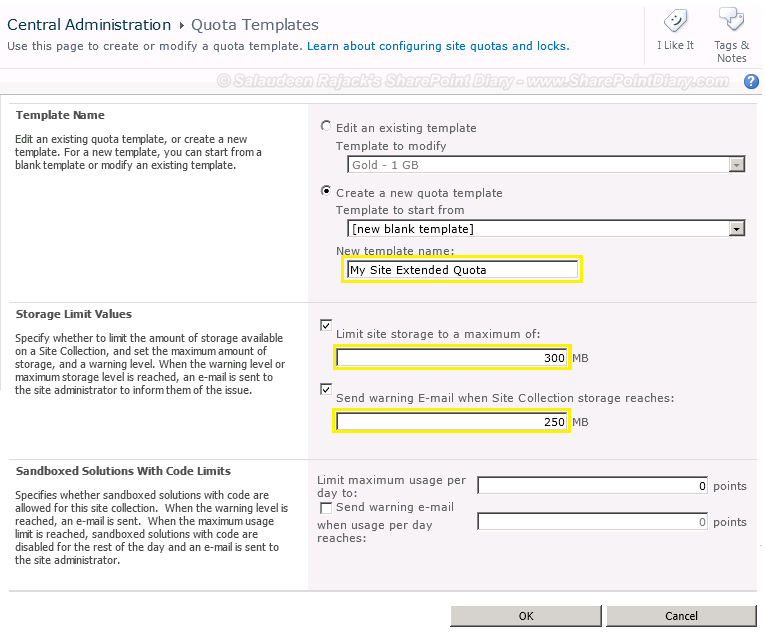 On the quota templates page click on "Create a new template"
Specify the maximum of storage limit, warning limits of the quota template. Write-Host "New Quota Template: $($QuotaName) has been added!" To update an existing quota template, use this PowerShell script.